"Regrettably, we found that China has been attempting to interfere in our upcoming 2018 election — coming up in November — against my administration," President Trump said Wednesday at a meeting of the U.N. Security Council. Looking on is U.N. Secretary-General António Guterres. "Regrettably, we found that China has been attempting to interfere in our upcoming 2018 election — coming up in November — against my administration," Trump said. He offered no details or proof to support that assertion. Chinese Foreign Minister Wang Yi — who seemed to be stifling a yawn as he sat nearby — was seen casting a sidelong glance at Trump and shrugging his shoulders. Later in the day, Trump held a news conference in which he said the accusation "didn't come out of nowhere," and "We have evidence. We have evidence. It will come out." "They do not want me or us to win because I am the first president to ever challenge China on trade, and we are winning on trade," Trump continued. "We are winning at every level." It's unclear whether Trump might have been referring to China's targeting of U.S. products from Republican strongholds in retaliation for U.S. tariffs on Chinese imports. In several rounds of tariffs, the U.S. has targeted Chinese goods ranging from handbags to toilet paper, while China has targeted U.S. products from soybean and corn to whiskey and cars. "We don't want them to meddle or interfere in our upcoming election," Trump said. Wang responded to Trump's remarks at the end of his own statement to the Security Council, saying, "We do not and will not interfere in any country's domestic affairs. We refuse to accept any unwarranted accusations against China. "China has all along followed the principle of noninterference in other countries' domestic affairs," Wang said. "This is a tradition of Chinese foreign policy." He also called upon other countries to observe the same principle, citing the U.N. charter. On Thursday, a spokesman for China's foreign ministry called on the U.S. to stop damaging relations between the two countries and suggested that it is Washington, not Beijing that has a reputation for interfering in the internal affairs of other nations. Republicans who represent areas hit hard by China's retaliatory tariffs have criticized Trump's tariffs, even as they say they agree with his position that China's approach to trade with the U.S. must change. In recent months, the Trump administration has unveiled a plan to give some $12 billion in government aid to farmers suffering in the trade dispute. Hours after Trump made his remarks, the White House gave a background briefing to discuss "Chinese interference." A senior administration official said on the conference call that China had targeted farmers and workers in districts that make up part of Trump's base. When Trump spoke about election meddling in the 2018 midterms, he did not mention Russia — a country that the U.S. has punished with sanctions for attempting to influence the 2016 election. This summer, reports also emerged that Russia's GRU intelligence agency, with an eye on the upcoming U.S. elections, had attempted to hack accounts related to the re-election campaign of Sen. Claire McCaskill, D-Mo. This is not the first time Trump has accused China of what he calls election interference. One week ago, he said in a tweet, "China has openly stated that they are actively trying to impact and change our election by attacking our farmers, ranchers and industrial workers because of their loyalty to me." The president, locked in controversies over his campaign's possible ties to Russian interests, has also said he wants the American public to pay more attention to China. One month ago, he tweeted, "All of the fools that are so focused on looking only at Russia should start also looking in another direction, China." 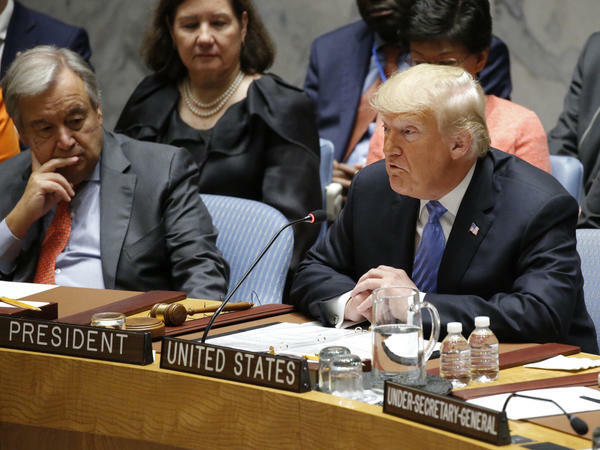 In Wednesday's speech to the Security Council, Trump's comments on China came as he reiterated his plan to reimpose sanctions on Iran, as part of the U.S. withdrawal from an international agreement on Tehran's nuclear program. All of those sanctions will be "in full force by early November," Trump said. "Any individual or entity who fails to comply with these sanctions will face severe consequences," the president told representatives at the Security Council meeting. Trump then quickly pivoted to Syria, saying, "I want to thank Iran, Russia and Syria for, at my very strong urging and request, substantially slowing down their attack on Idlib province and the 3 million people who live there." "I hope the restraint continues," he said. "The world is watching." From there, the president turned his attention to China. Trump's remarks at the Security Council meeting followed a similar pattern to his speech before the U.N. General Assembly on Tuesday, when he alternately attacked China and praised its leader, Xi Jinping. After accusing China of seeking to undermine his administration, Trump said it "has been a pleasure and an honor" to work with Xi, along with South Korean President Moon Jae-in and Japanese Prime Minister Shinzo Abe, in attempts to broker peace on the Korean Peninsula. In the news conference later, Trump said he and Xi "still probably have a very good relationship." On Tuesday, Trump had extended "special thanks" to Xi for support of U.S. efforts to get North Korea to commit to denuclearization. But in that speech, too, he also called out China for its economic practices. "The United States lost over 3 million manufacturing jobs, nearly a quarter of all steel jobs, and 60,000 factories after China joined the WTO," Trump said on Tuesday. "And we have racked up $13 trillion in trade deficits over the last two decades. But those days are over. We will no longer tolerate such abuse." In China, those remarks did not find a receptive audience. State-run news agency Xinhua said in a tweet that Trump spoke "in face of blank stares, head shake, frowning."